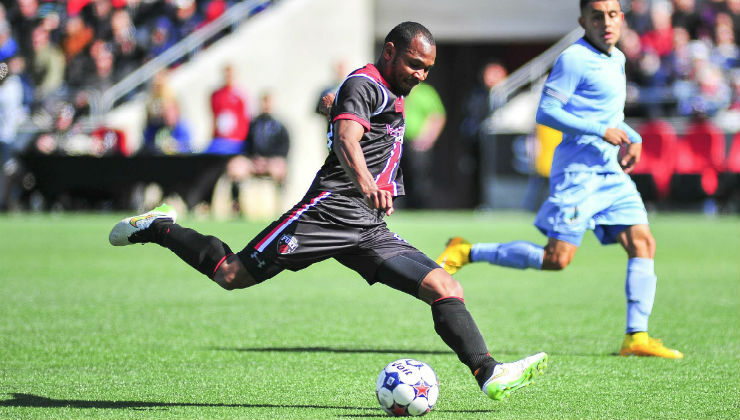 Ottawa Fury FC kicked off their first home match of the 2015 season Saturday afternoon with a 1-0 win over Minnesota United FC. Forward Tom Heinemann netted his first goal of the season midway through the second half which proved to be all Fury FC to collect their first win of the season. “For our team to get three points off a quality team like Minnesota is very good to get off at the beginning of the year,” Fury FC goalscorer Tom Heinemann said. Fury FC set the pace early with a few quick chances. The best chance came from Heinemann, who was turned away in the box by Minnesota United FC goalkeeper Sam Ndjock. In the 20th minute, Ndjock was given a yellow card for handling the ball outside of the box. Ottawa had a glorious opportunity to take the lead on the subsequent free kick, but Paterson was denied by a fantastic save from a diving Ndjock. In the 36th minute, home fans jumped up to celebrate what looked like Ottawa’s first home goal of the season, but the attempt was ruled offside. That didn’t seem to bother Fury FC, as they continued to test the busy Minnesota 'keeper. Both teams remained scoreless through the first half, with the majority of chances coming from Ottawa, who finished with nine shots on target through the opening 45 minutes. “It was the easiest halftime speech I think in my life. ‘Guys keep doing what you are doing because the goal is going to come,’” Ottawa Fury FC head coach Marc Dos Santos said. In the second half, Fury FC's offense went back to work with a low drive attempt by Nicki Paterson in the 52nd minute. In the 68th minute, the home side would finally get on the board, as Heinemann would finally break the deadlock to ignite the home crowd. Ottawa would hold on to the 1-0 lead in the late stages of the game. “We dropped some points today that I think we deserved to drop, so we have to really be honest about how we are going to get better,” Minnesota United head coach Manny Lagos said. United was unable to find the late equalizer despite a late offensive push. The Loons will look to rebound from this setback, as the team returns to Minnesota for its home opener against the San Antonio Scorpions. The match will kick off at 8:00 p.m. ET on Saturday, April 25th at the National Sports Center in Blaine. Fury FC host the Fort Lauderdale Strikers at 3:00 p.m. ET the same day.